There is enough sun for solar to work in Ohio? At Ecohouse Solar, we hear from many people who think there is not enough sunshine in Ohio for solar panels to really work. This seems to be a common misconception. The winters in Columbus are definitely cloudy, but as a solar system owner I can say that there are plenty of sunny days, even in the winter. The fact is, there is plenty of sun in Ohio for solar to work well. There is more sunshine in Ohio than some other places that have lots of solar. Germany is a leader in solar energy use, yet Ohio has 30% more sunshine per year. Some leading solar states such as New York, New Jersey and Massachusetts have roughly the same amount of sunshine per year as Ohio. 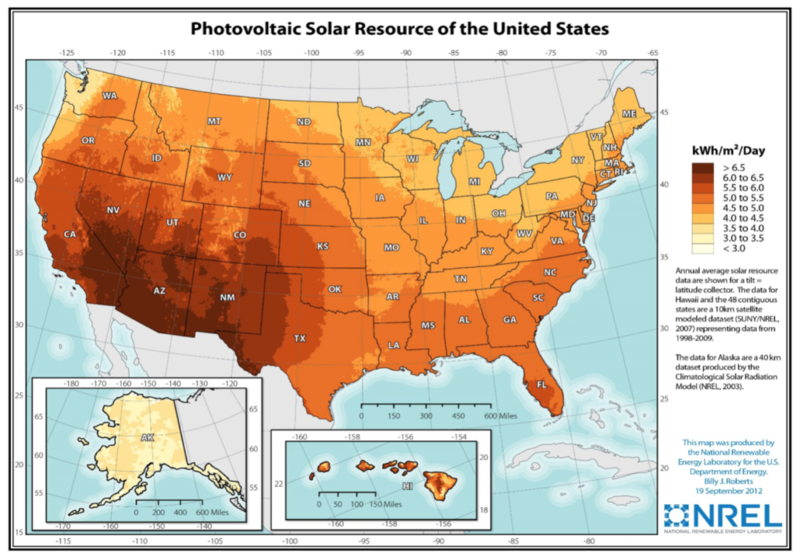 The US Department of Energy, National Renewable Energy Laboratory tracks how much sun falls on every zip code in the US (See pvwatts.nrel.gov). They classify the amount of sunshine as the amount of sun hours per day. Columbus Ohio has 4 sun hours per day, which means there is a specific intensity of light for an average of 4 hours per day through the year. The amount of electricity a solar panel produces is determined by the latitude where it is located, which direction it faces and how much solar radiation it receives each day. In Columbus, Ohio we are located at the 40th degree latitude, so solar panels in Ohio will produce the most electricity if they face directly south, with no shading, at a 30-degree angle. If the solar panels were located in an area with more sun hours per day, such as Arizona, they would produce more electricity, however Ohio works just fine for solar. As a solar installer, Ecohouse Solar can accurately predict how much electricity each solar design will produce each year. We can do this because we know how the orientation of the solar panels, their efficiency rating, and the amount of sunlight affects their output. Knowing the solar electric production information allows us to calculate the financial payback for any particular solar design. We have software that accurately make these calculations. In making a decision to purchase solar, the amount of sunshine is important, but what is more important are the local electricity rates and whether there are financial incentives for solar. Please contact Ecohouse for a free solar design and estimate for your home or business.